I have heard from a friend that if you certainly love music and you want to search for a great music destination, then Nashville is really a good option. This is where you can watch your dream shows and concerts with that music festival atmosphere. Isn't it cool to visit Country Music Hall of Fame and Museum? How about exploring legendary music venues like Grand Oly Opry and Ryman Auditorium. 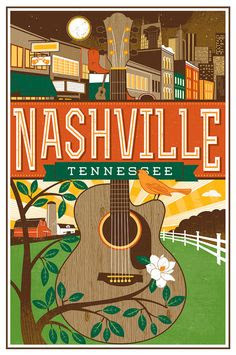 How about shopping for that Hatch Show Print which is a perfect Nashville souvenir? There's a lot to explore visiting this Music City, a must destinations for music lovers/travelers. However, if you just like to shop for some authentic and quality brands of musical instruments and accessories, then you need not go further. You can get the Apogee's top of the line by simply shopping online. Pick your choice, they have all these state of the art equipment at guitar center. I'm not really into music but I have friends who are. I'm sure they will find Nashville to be a great destination although I would prefer a place where I could catch a glimpse of nature. But that;s what traveling is all about. To derive pure pleasure seeing what you really love. So whether you are a music lover, a nature tripper, souvenir hoarder or simply want to back pack, there's a lot more to explore when it comes to traveling. On the second thought, Nashville City can be in my bucket list. What do you think?